I was inspired by @CommanderDave 's list. I decided to try a VSD-II instead of an Interdictor, then of course squads and upgrades are different because it's a 500 point game. Added an Arquitens because I could. My first time flying an Arquitens! My friend had Emperor Palpatine as commander, a nasty Cymoon with Director Krennic, Quad Laser Turrets, Spinals, Quad Turbolaser Cannons, etc. Also Quasar and two Goz, one with Comms and one BCC. 10 squadrons, pretty bomber heavy. My friend chose 2nd player, and I chose his Targeting Beacons. My friend underestimated the power of my VSD and the Demo with Fletchettes. 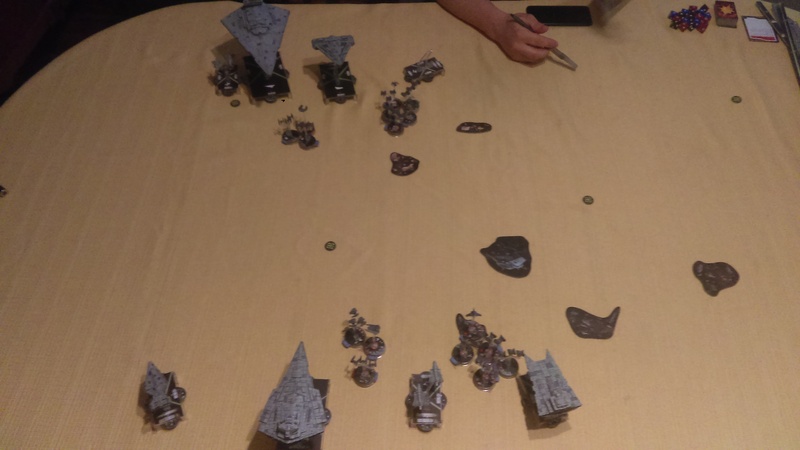 My first power play was activating Demo at the beginning of round 2, hitting his Maarek and IG-88 with Fletchettes. My squads would not have survived as long if I had not done that. 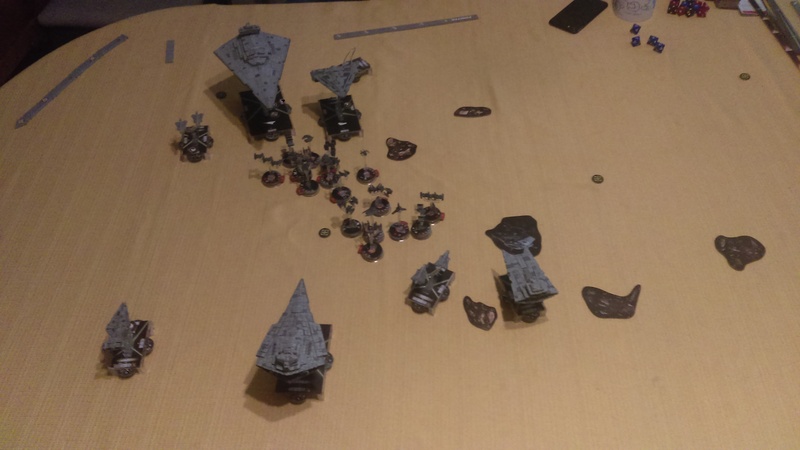 Second, my Governor Pryce VSD went last at the end of round 2, hitting both ISD and Quasar with DCaps out of the front arc. HIE against ISD. Then I went ahead at speed 1, staying in long range of the ISD. At first I thought this was a mistake, thinking I wouldn't get a medium range shot next round, but now I know this was the right move after all. In round 3, I activated Demo first and hit his Quasar's front with my front arc, flew ahead at speed 3, then hit its side with my side. My Arquitens got a really good double arc shot with a CF against his ISD, despite not using QBTs.He flew his Cymoon in at speed 1, avoiding my QBTs. Made a nasty hit against my VSD, but had two accuracies and targeted my redirects. I braced 8 damage down to 4, but discarded my brace due to Palapatine. 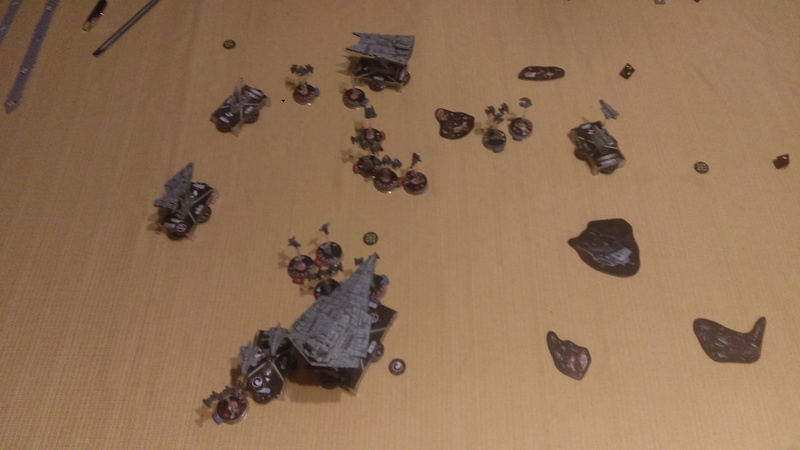 My Maarek attacked his ISD twice with Jendon. Finally, my VSD activated last again, had a fantastic roll against his ISD once again, doing HIE on his one remaining side shield + 7 damage to the hull, just enough to kill it. Really fun game! I only lost Mauler Mithel, Ciena Ree and Tempest Squadron. They did their job tying down my opponent's bombers, protecting my Demo and VSD from getting wiped out. Nice one, glad the VSD worked out! The HIE damage output is pretty awesome. I love how it lets the medium bases go toe to toe with ISDs. Yeah, the VSD is a lot of fun when it works out, but even when it's doing well, it feels a bit like teetering on the edge of a cliff. The damage output is fantastic, but your list with the Interdictor has much better defense. With no ECM, Brunson or Targeting Scramblers, the VSD feels very vulnerable. The payoff can be great though! Here's the 400 point list I originally came up with before we decided to play 500 points. I'd like to play this one sometime too. I have Jonus instead of a Firespray because he's great with Warlord.